Welcome to the Tam Twirlers! 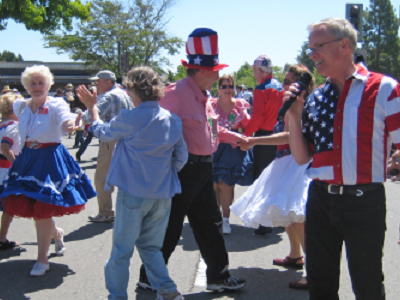 We are a Modern Western Square Dance club in San Rafael, California. We are a friendly group of singles and couples who love to get together to socialize, have fun, and dance. 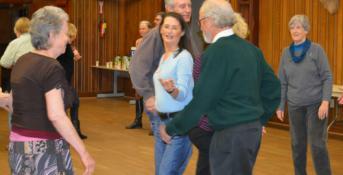 We dance Plus level every Wednesday at the Marin Rod and Gun Club. It is conveniently located just off 580 at the west end of the Richmond-San Rafael bridge (map and directions). Our caller is Eric Henerlau, a Corte Madera resident who has been calling since 1980. We have a Round Dance class with Dan and Allison Drumheller from 6:00 to 7:00, followed by Square Dance to 9:45. Guests are welcome, and you don't need to have a partner. The Marin Independent Journal recently did a wonderful write up our club. The article lets you see what a night at Tam Twirlers is like, the kind of music we dance to, and how fun it is to square dance. You'll also meet our talented caller, Eric Henerlau, and hear from some of our members on why they enjoy square dancing. To learn more about our club and see pictures and videos, click here. Club member Jolie put together some nice videos of our Halloween dance party and Holiday dance party.